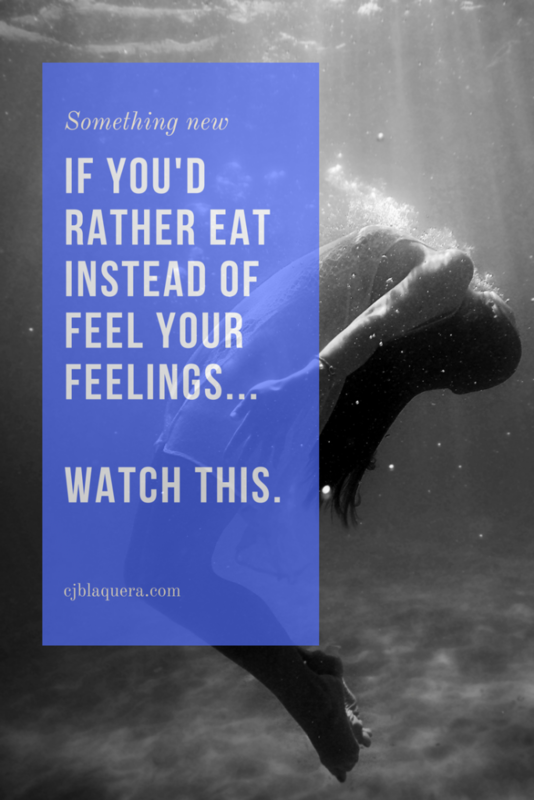 When I actually love my emotions, instead of eating to drown them out, life is so much better. One distorted, yet reliable, way that my emotions claim the attention from me that they so richly deserve, is by driving me to overeat. That is an attention-getter for sure, especially when it ultimately winds up as extra weight on my hips. After all, negative attention is better than no attention. But…loving attention outshines negative attention any day of the week. 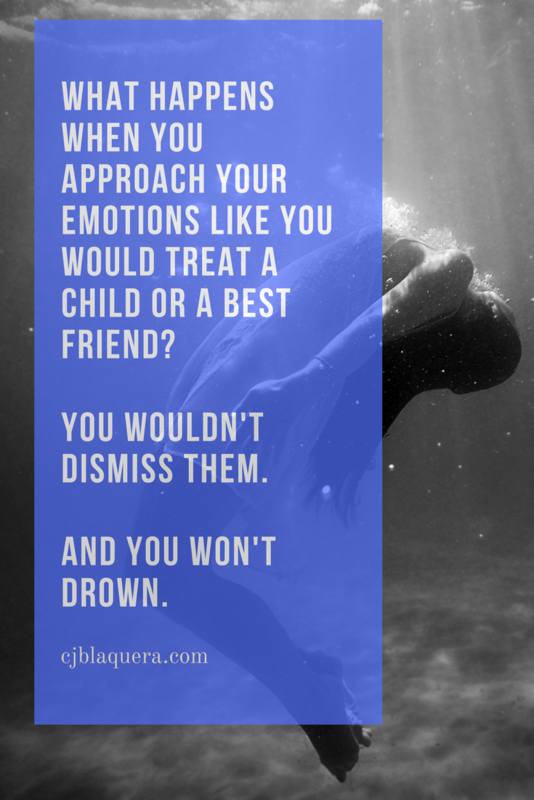 The video below documents the shift that is happening as I start treating my emotions in this same way I would treat a child in pain. There tends to be less overeating when I willingly give my emotions my loving attention. [00:00:00] Just got out of yoga, and on my way to yoga I wanted to just abandon my yoga class, go to Starbucks, go read a book. Didn’t want to go to yoga class, but I thought that it would be good for me so I wound up going to yoga class. [00:00:22] I was probably about three or four minutes late. I set up in the back of the room. Usually, I’m in the front of the room. For the first half of the class – it’s an hour class – I was weeping my way through the class. Trying to be inconspicuous. I think I eventually went into a Child’s Pose which is with your knees bent and head, forehead down on the mat. It was a very interior, reflective kind of pose, and my face was hidden. I didn’t have to feel like people were aware of what was going on with me or that I was bumming people out or freaking them out or making them concerned for me. [00:02:24] How can I offer compassion and understanding in a way that walks that razor’s edge between compassion and understanding but not necessarily agreeing or adding to the suffering and adding to a sense of being a victim. [00:02:54] Maybe that sounds harsh. [00:04:32] It was so many things. It was such a cocktail this morning. [00:04:36] That’s the flavor of the way that I was talking to myself. It was very slow-paced. The emotion, the weeping came in waves. [00:04:48] I was grateful that it wasn’t sobbing so that I didn’t draw attention to myself, but that I could experience what I was experiencing. It was a slow process for me. Then, at a little over halfway through class, I kind of felt like either I want to leave or I want to join the class. I want to move my body, move this e-motion; energy in motion is what emotion has been described as. [00:05:16] So, I did that, and I wound up doing a pose (that I normally have to assist myself with) the best that I’ve ever done it. It was kind of interesting. Anyway – and I joined the class, and I was not weepy really for that second half – little less than second half – of the class. [00:05:34] I just drove here to do this check-in with you, and I passed a donut shop. Like damn! A donut sounds so good! I wanted to go to Starbucks and have Hot Chocolate before that. I just want something warm and cozy and comforting, and then I passed the donut shop. 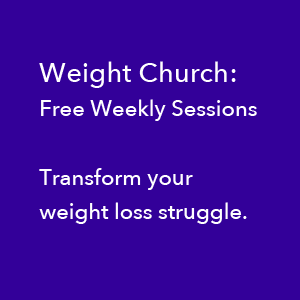 Last week, I would think about something like, “Oh, a piece of chocolate sounds good” – which I went and ate a lot last week. I might have a fleeting thought like, “You know that won’t really help,” and I was like, “So what? I don’t care. I want the chocolate anyway” or I want this food anyway. [00:06:09] The donut this morning was the first time where I thought this weeping that I’ve been doing, this “on edge”, this feeling like I don’t have my space at home, this feeling like I don’t have anything in the reserve tank, and it’s getting harder to deal with the Alzheimer’s; my mom’s behaviors are more than they have been. [00:06:38] A donut can’t really help me with that. [00:07:09] A donut is not going to help that. It’s not going to address any of that. [00:07:26] I hope you’ll do your best to be kind to yourself and to offer yourself love, your own loving attention when you’re tender. That’s what I was this morning. That’s what I still am. [00:07:46] When you’re tender, I think what we want most is our own loving gaze to ourself. We want the love that only we can give ourselves, and I am just figuring out how to do that. [00:08:03] What does that really mean? [00:08:04] It’s like I’m in philosophically with that, but what does that mean when you want to run from yoga class — but you want to run from your house and you want to run toward a cup of Hot Chocolate. What does it mean when you have these serious things in your life? When you have stuff like a mother with Alzheimer’s who’s getting worse and when your energetic savings account is getting depleted, what does loving yourself really look like? What does it look like? [00:08:42] When it seems like it means someone else is going to suffer, like my mother, do you make that choice? Okay, I love myself and I am willing for her to suffer based on that choice. I’m willing for there to be consequences for my mom based on that choice that I’ve made for myself. That’s the vice that I find myself in. [00:09:23] Push is coming to shove in this situation, and those questions I want to answer for myself because I don’t want to go down with this ship. [00:09:39] So, a lot going on. [00:09:47] I just get ready to leave, to go home, and actually felt so much better and like I could handle going home. [00:10:08] Hallelujah! I’m going home. I’m going directly to make my Protein Smoothie and have breakfast. Do not pass – what is it? Do not pass “Go”, do not get out of jail? I don’t know. Whatever that Monopoly phrase is! [00:10:22] That’s my plan. I’m not going to go to a donut shop. I’m not going to go to Starbucks. Glory, hallelujah! It’s after 11am, and I was so relieved and happy to see that I didn’t have to wait an hour to eat. [00:10:50] Negative four (-4) so I’ll be going home and eating. 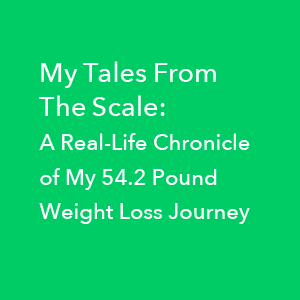 Click for access Weight Church and all episodes of My Tales From The Scale.